It has become a bit of a tradition over the last couple of years to celebrate the beginning of spring with a wild garlic recipe. The wild garlic has just appeared over the last week in my local woods and this is when the young leaves are at their best. 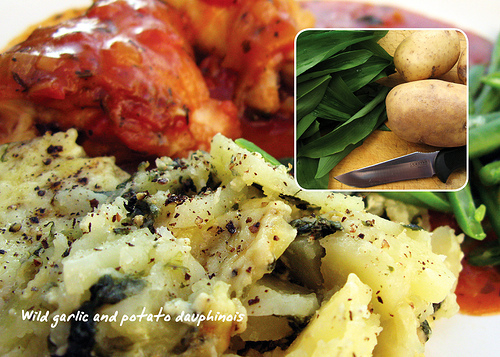 Here is a twist on a traditional potato dauphinoise recipe. Blanche the wild garlic and chop. Create alternate layers of thinly sliced potato and wild garlic and so on finishing with potato. Pore over the infused milk/cream, cover and cook for 40 minutes (200 C), remove cover and finish with some cheese for 10-30 mins or until top layer is browned. For the dauphinoise: double cream and milk, bay leaves, salt and pepper, pinch of nutmeg and some butter.